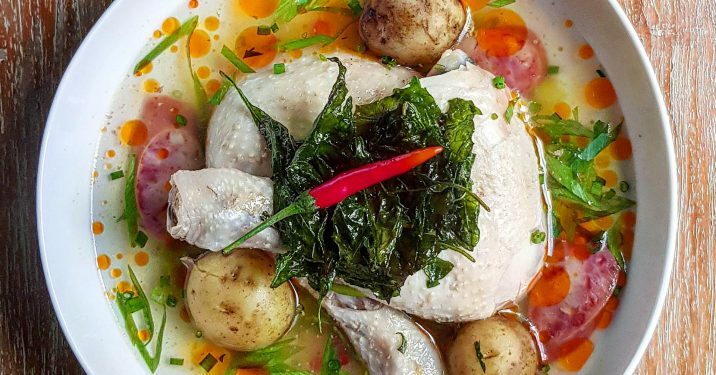 The marriage of Filipino Tinola and Singaporean Hainanese chicken are perfect for the rainy season. Mostly every country around the world has their own unique version of a chicken soup. 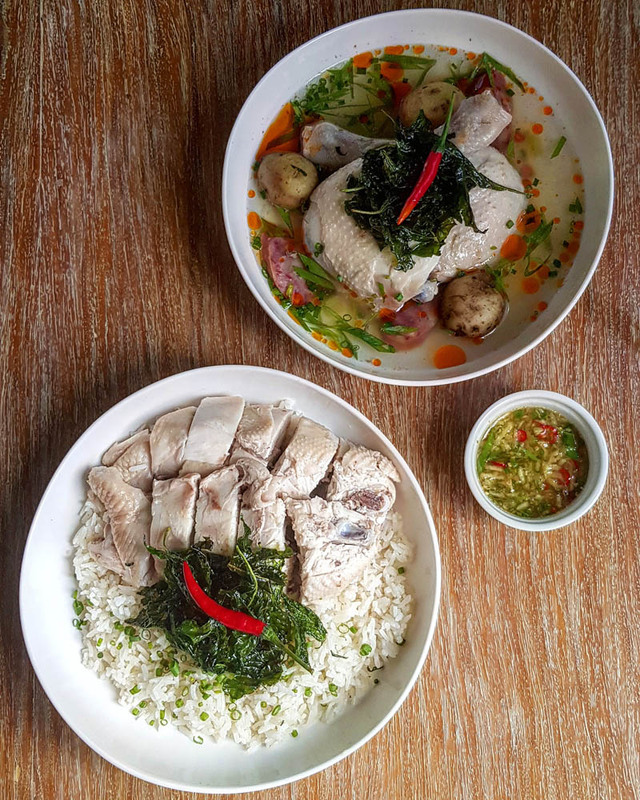 Tinola is the Philippines’ version while Hainanese Chicken is Singapore’s version. Both are pretty similar in taste, given the strong base of ginger and onions/spring onions for both soups. However, technique-wise, they are very different. 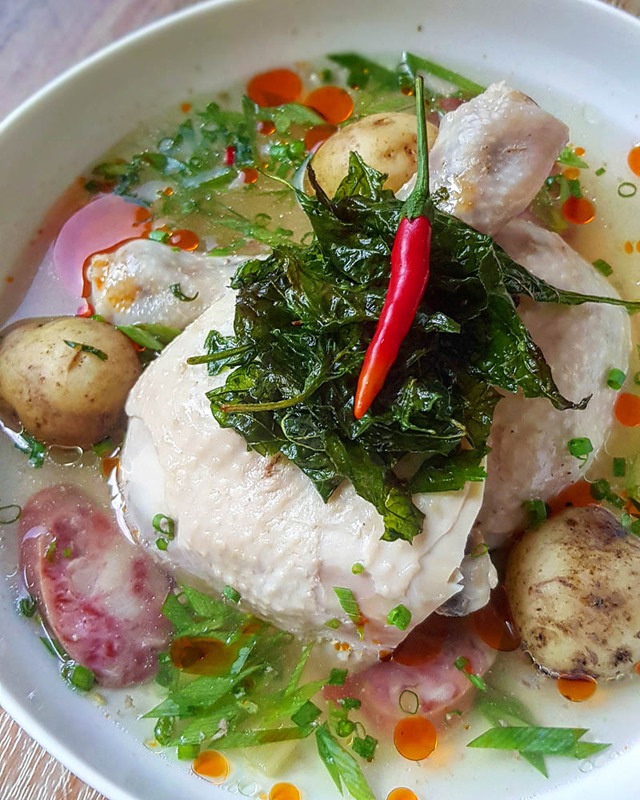 In this recipe, I use the Hainanese Chicken method to keep the chicken extremely juicy and the skin almost like jelly. 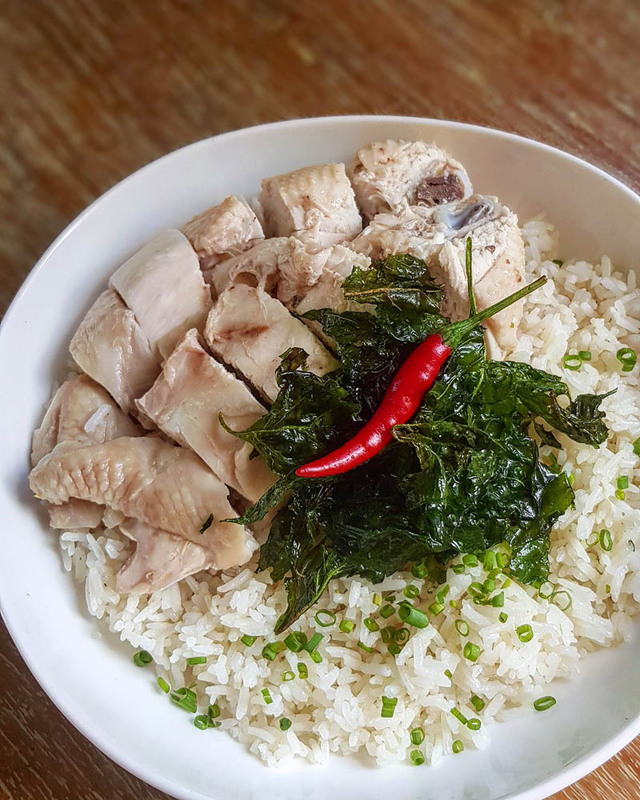 I then combine this technique with the ingredients I would normally use for my Tinola; creating a marriage that makes a lot of sense and is really tasty and satisfying. 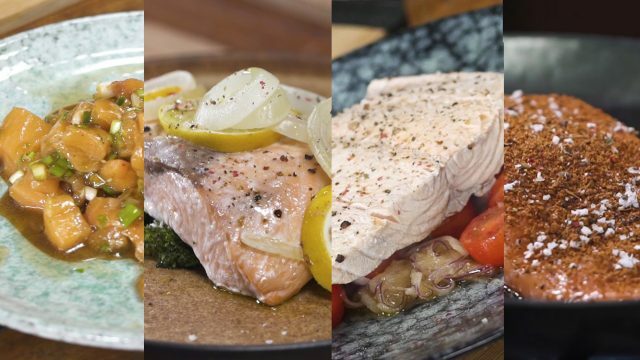 The spicy ginger dipping sauce is a must when cooking this dish, as it provides the right burst of spiciness, saltiness and acidity in every bite. 1 Rub salt all over chicken, including the inside of the carcass. Let it rest in the fridge for 1 hour. 2 In the meantime, peel and cut ginger into 1/4 inch slices. 3 Sautee ginger, celery, and garlic until fragrant. 4 Add the chorizo slices, sautee for 1-2 minutes. 5 Add spring onions, baby potatoes, warm water and bring to a boil. 6 Once boiling, ladle boiling stock on the skin of the chicken (as if giving it a bath) for 5-10 minutes or until the skin starts to cook. 7 Submerge chicken in the boiling stock and simmer for 5 minutes with the lid off. 8 Simmer for another 10 minutes with the lid on. 9 Turn the heat off and do not remove the lid. Let sit for 35-40 minutes. 10 In the meantime, make the spicy ginger sauce (see ingredients below). 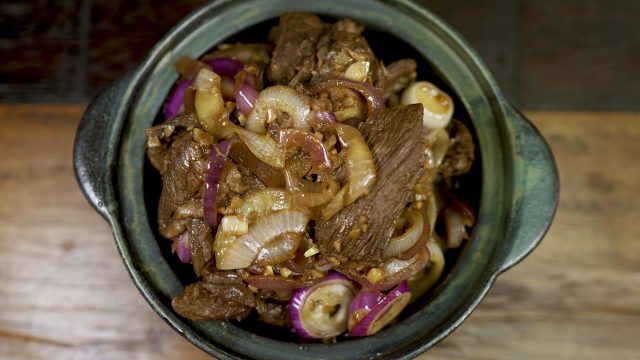 11 Grate 1 tbsp ginger and combine with other ingredients in a small bowl. Taste and adjust to your liking. 12 In a separate smaller pot, heat 1/2 cup of oil and fry the chili leaves until crispy. 13 When the chicken is ready, remove from pot and submerge in a large container with ice water to stop the cooking process. This will also allow the skin to soften and have a gelatinous consistency, much like Hainanese chicken. 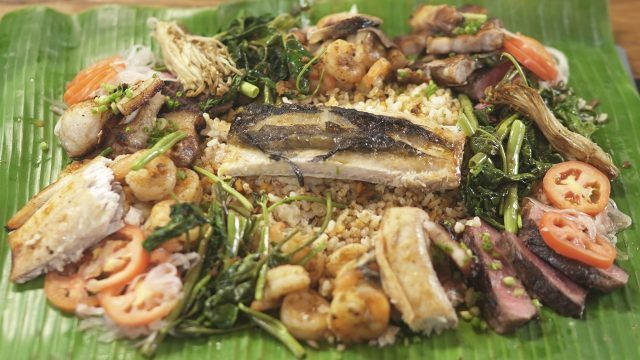 14 While the chicken is submerged, make the chicken rice (see ingredients below). 15 Combine the Jasmin rice, chicken soup, garlic, ginger, and oil in a small pot. Add a pinch of salt to taste. Boil until rice is cooked. 16 Once chicken is no longer hot, remove from ice bath. Chop into desired pieces and serve with the chicken rice, spicy ginger sauce, and chili oil.